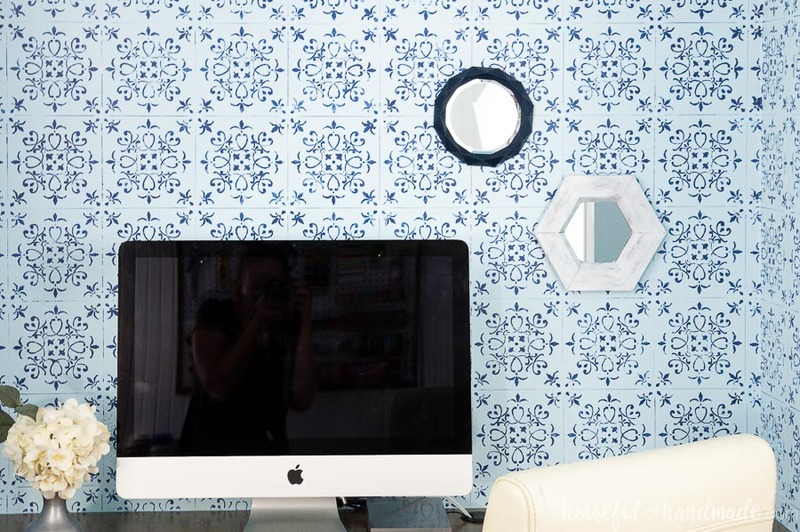 Decorating doesn’t have to be expensive, make beautiful hexagon wall mirrors out of paper. When you think of making things out of paper, do you ever think about making home decor? I know, it sounds crazy but you can make some amazing things out of paper! I love using paper because it is cheap. 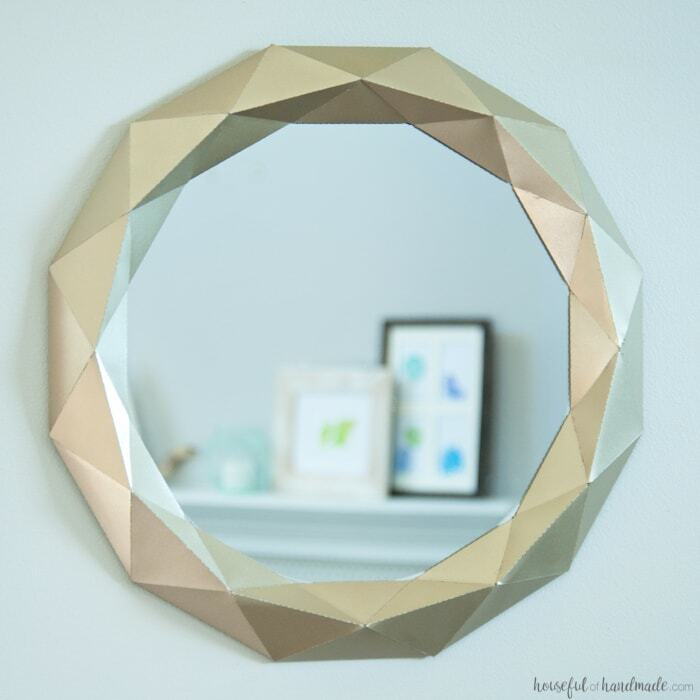 And can be made into lots of different 3D shapes like this awesome hexagon wall mirror frames! Yep, totally made out of paper. When you are decorating your home, don’t let it get expensive. 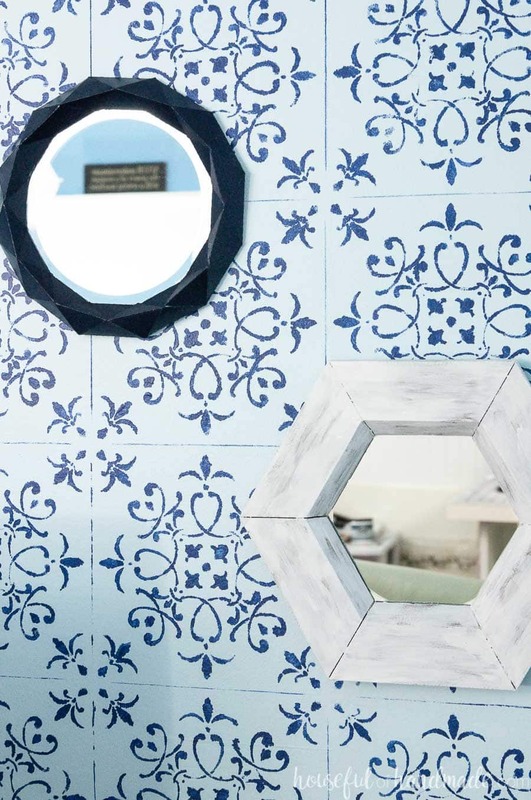 These easy hexagon wall mirrors made out of paper will help you save money but add lots of style. This cheap wall mirrors cost less than $2 to make. It’s made out of 2 pieces of cardstock, a little hot glue, acrylic paints and a dollar store mirror. How’s that for budget friendly decor! 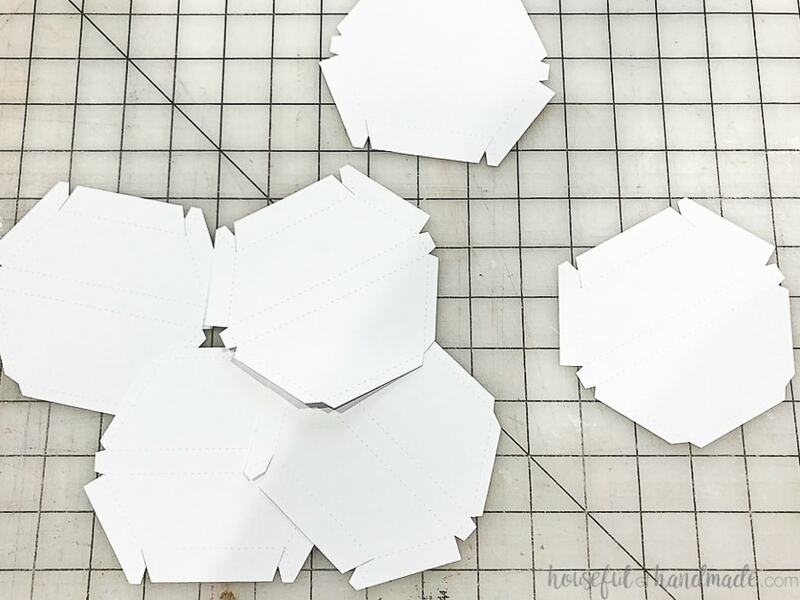 The tutorial today is for the chippy white hexagon mirror you see in these pictures. But you are probably also noticing the navy blue geometric mirror too. No worries… I you can get all the details for the Anthropologie knock-off mirror here, and bonus, its made out of paper too! One of the things I love about paper decor is how easy it is to make it fit exactly what you need. For my hexagon wall mirror, I wanted to make it fit a dollar store mirror. Which was the perfect size for adding a little style to my office in a closet. 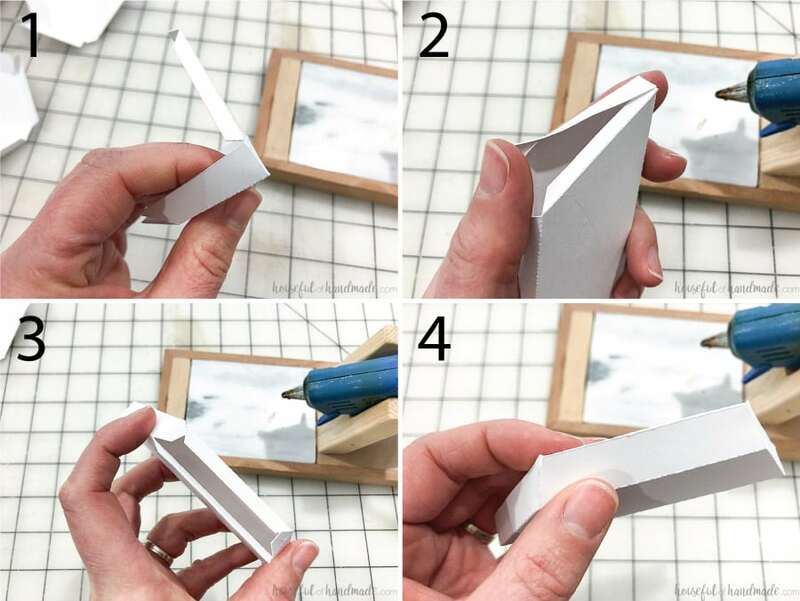 But if you want to make the DIY mirror frame larger to fit your decor, you can easily resize your 3D paper design. Just make sure to follow these steps. Open all the files for your 3D object. Copy and paste them all into one file (or board). Make sure to resize all the pieces together so they are all resized to the exact same percent. When resizing, make sure the height & width are resized the same percent. The easiest way to do this is to lock the aspect ratio. Use your new files to cut out your 3D designs from paper. You can move them to their own file (or board) if there are a lot. Once you get the hang of resizing 3D designs, you are going to realize how many different ways you can use them. I love being able to make my favorite designs bigger or smaller as needed. I am sharing the cut files & PDF for this paper mirror frame in my subscriber library until 2/10/2019, then they will move to the shop. Click here to subscribe to my newsletter and gain access to all the freebies. If you already have your password, click here to download them. Or you can use spray paint like I did for the Anthro mirror knock off for a more modern look. You need a 5″ round mirror for the files as sized, but will need to adjust if you resize them. Click here to see my favorite crafting supplies. Cut 6 of the mirror frame pieces out of cardstock. I like to use a heavier cardstock, but regular cardstock works well too if that is all you have. 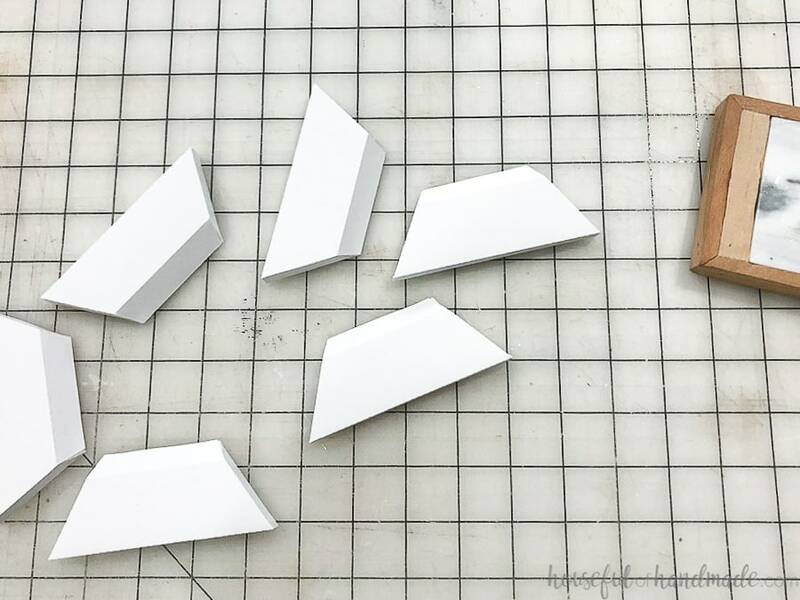 To make cutting 3D paper home decor easy and precise, I love using my Silhouette Cameo. Fold along all he dotted lines. Fold them all towards the center. Because I used my Silhouette Cameo to cut it out, all the dotted lines are cut to make folding easy and precise. I you are cutting these out by hand, I recommend a scoring board to get clean fold lines. Glue the tabs on the center back to the front sides. Glue the tabs on the back to the front sides (underneath). 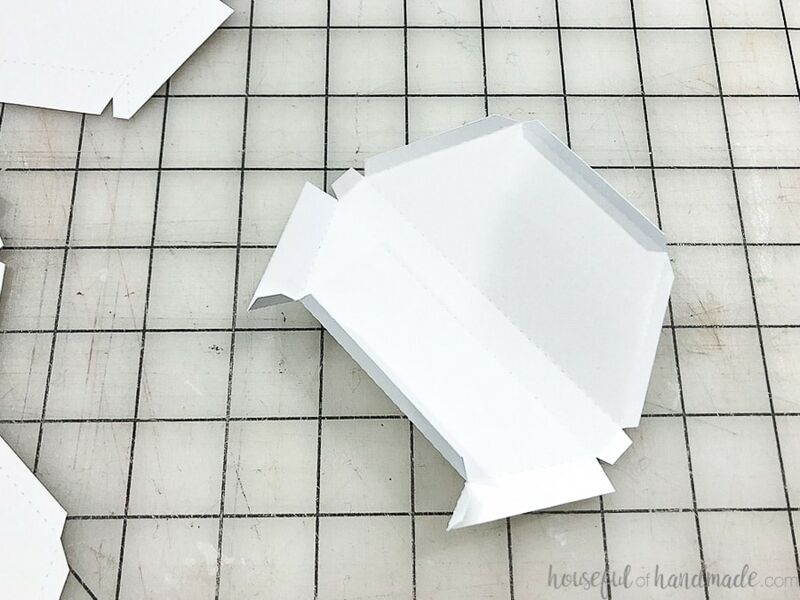 Fold all the tabs on the front inside and pull the flap up. Add glue to the tabs and then pinch the flap down to secure. 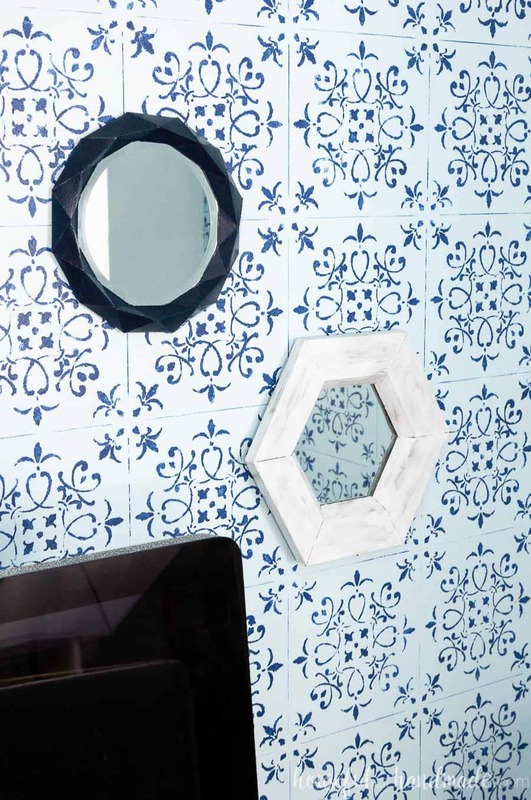 Repeat for all 6 hexagon wall mirror pieces. 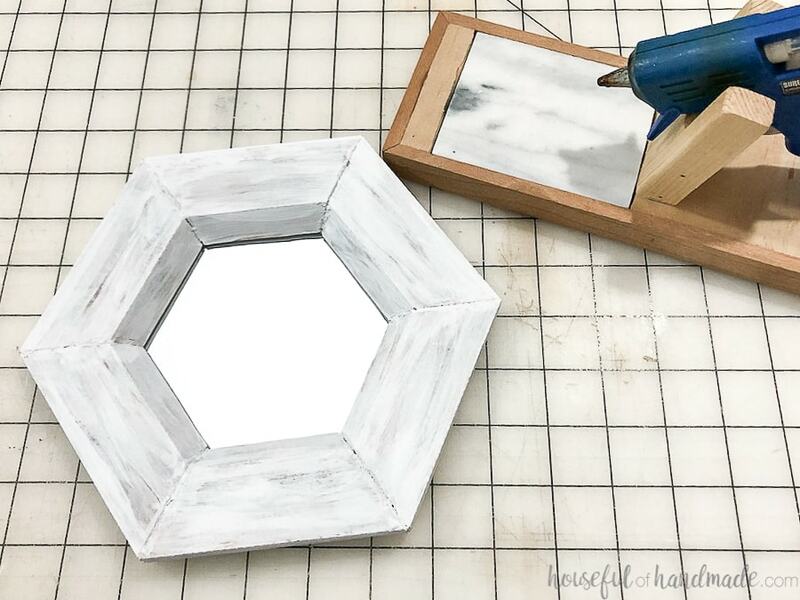 To make your hexagon shaped mirror, add a generous amount of glue to the side of one of the pieces and secure it to the side of another. Make sure the glue is close to the edge to give you a cleaner look instead of just in the middle of the piece. Continue until you have a hexagon frame! 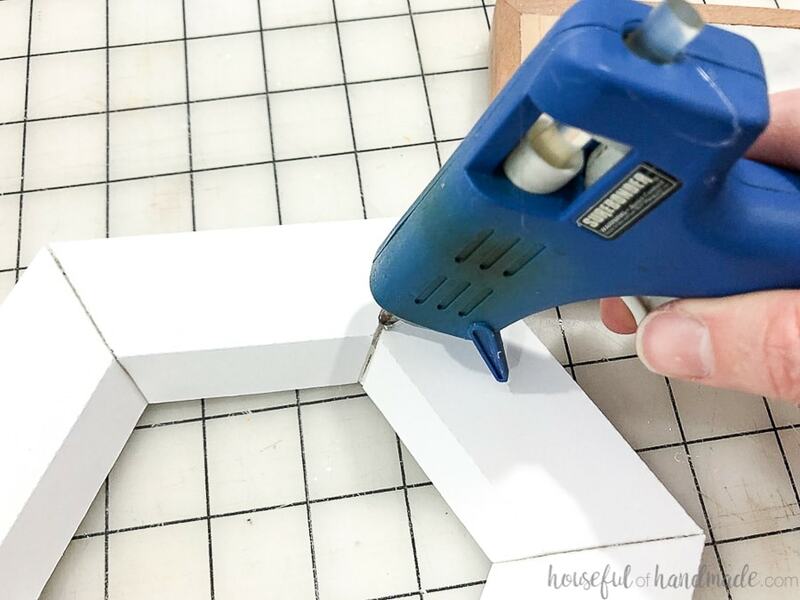 If the slight gaps in between the frame pieces bug you, fill them in with hot glue before painting. To do this just run a small bead of hot glue along the seam and then run your finger over it to smooth it out (like you would caulk). Now you can paint your frame however you want. For the geometric wall mirror frame, I painted the one in my office with navy spray paint and the one in my living room with Champagne Mist metallic spray paint. 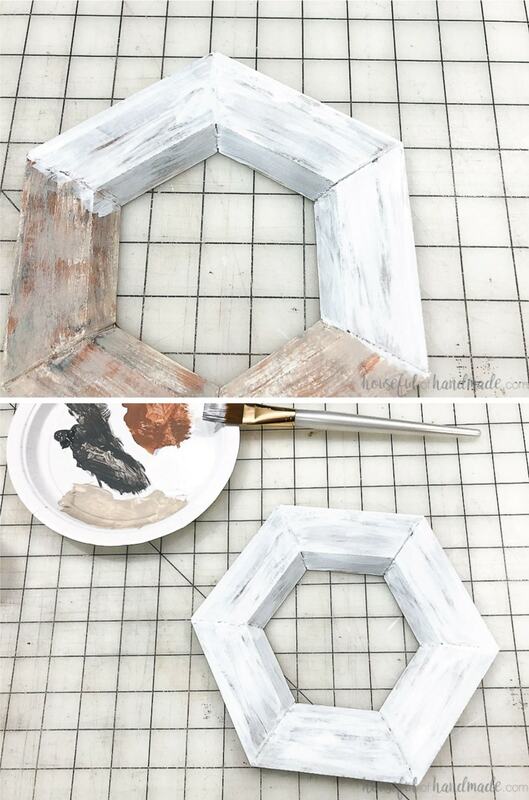 To paint your hexagon wall mirror frame to look like aged white chippy paint (like I did), you will do a base layer and then a top layer. The colors you use in the base layer will give the appearance of wood under the white. I used a warm brown, dark gray and beige for my underlay. Using a dry brush technique, brush the paint on the frame. Make sure to mimic the grain of wood by going from seam to seam parallel with the back of the frame piece. I started with brown, then gray, and finished with beige on top. No need to let these dry between coats, it’s such a little bit of paint and if they get mixed a little it doesn’t really matter. Let the bottom layer dry completely before painting the white. Use a little more paint you brush than the bottom layers, but still use. dry brush technique. Cover the bottom layer with the white paint, but let bits peak through in areas. Some areas just let there be a light coating of white so it barely peaks through, other places let no paint cover it so more peaks through. And make some places more white. 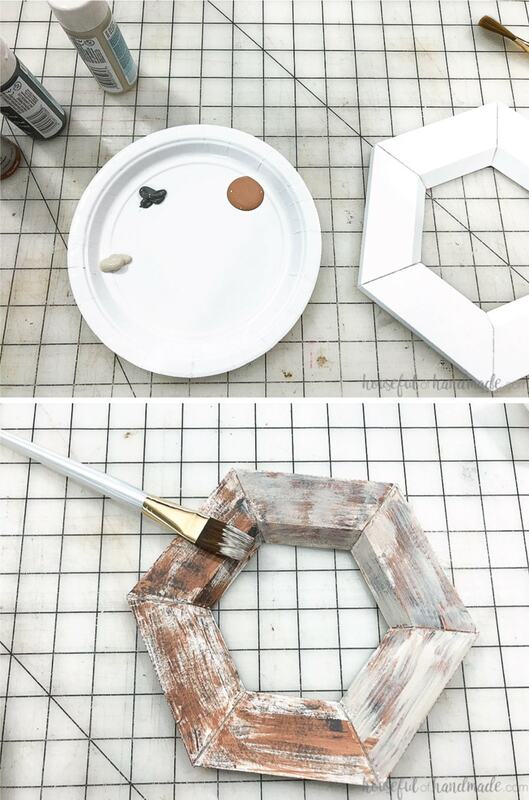 Let the paint dry, then to attach your mirror to the frame, just secure it with some hot glue. Super easy! One of my favorite things about paper mirror frames is that they are very lightweight. These DIY wall mirrors can be hung with just a simple Command Strip. Perfect for a dorm room or rental! And even though everyone knows I make decor out of paper, they still have to touch the frame to know that it is not really wood! Amazing Home Decor Made Out of Paper! Decorating your home does not have to be expensive. You can make beautiful paper home decor that no one will guess is made out of paper with these easy tutorials! Lanterns are a great home decor item that can be placed anywhere you need to add a little style. 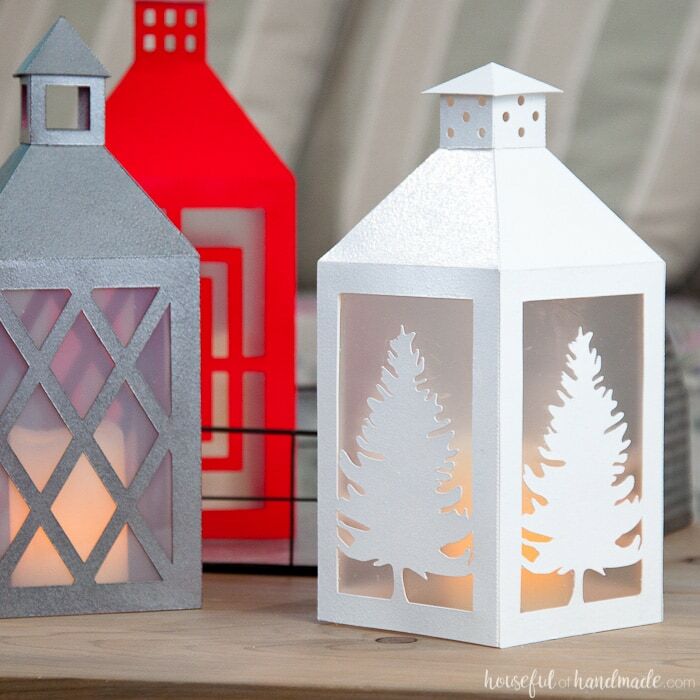 These ones are made out of paper and transformed to look like expensive home decor lanterns. 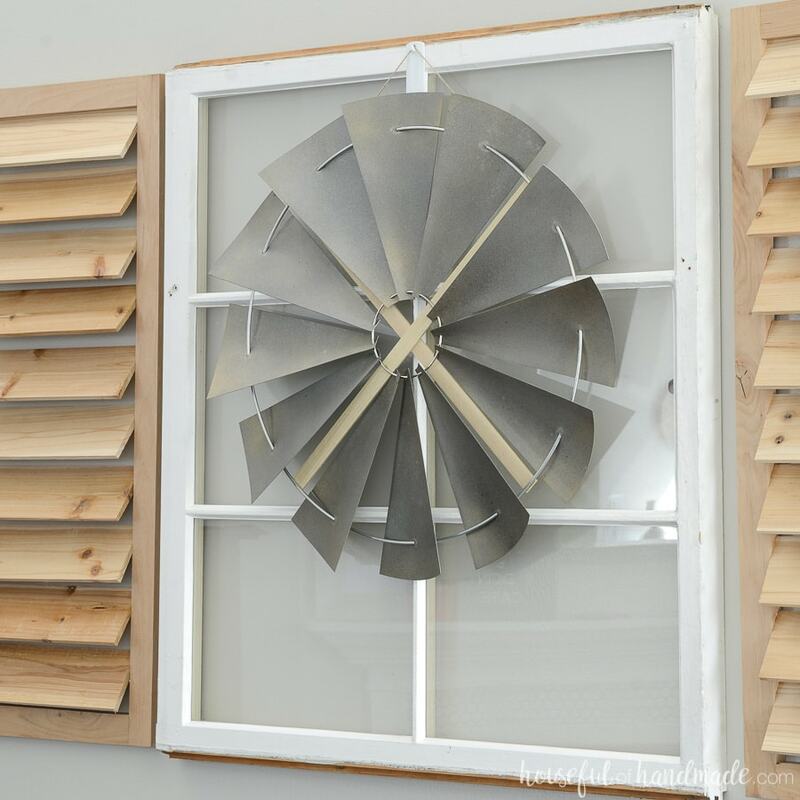 Don't have $150 to spend on an old windmill? You don't need to spend that to get this beautiful decorative windmill in your home. Make this one out of paper for $10 instead. 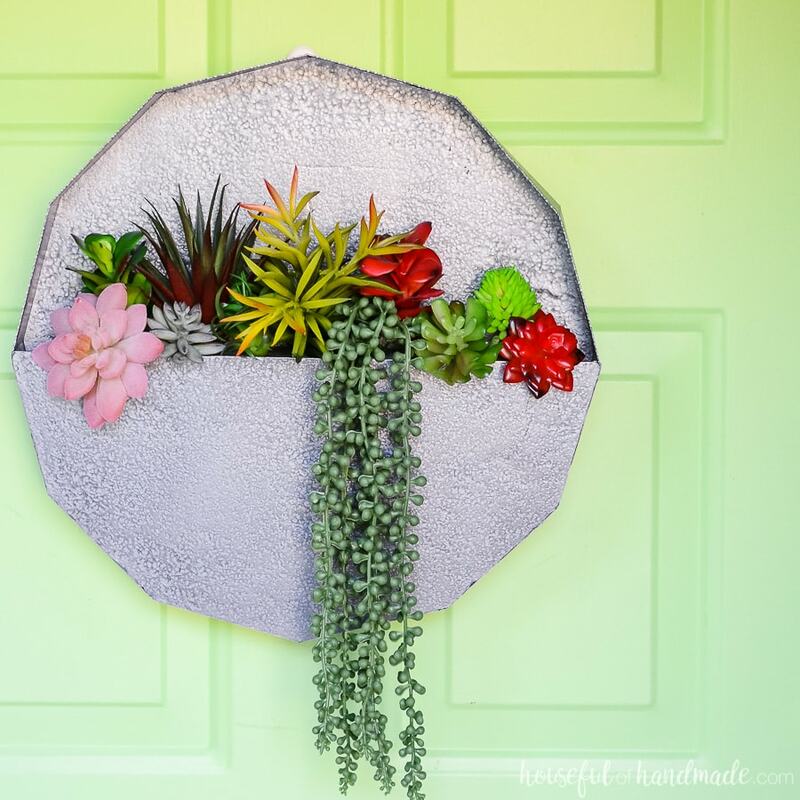 This unique wreath is great for succulent lovers! And better yet, it is made out of paper and the faux succulents will never die. No watering required! Pass up the expensive wall mirrors at the home decor stores and make this one instead! 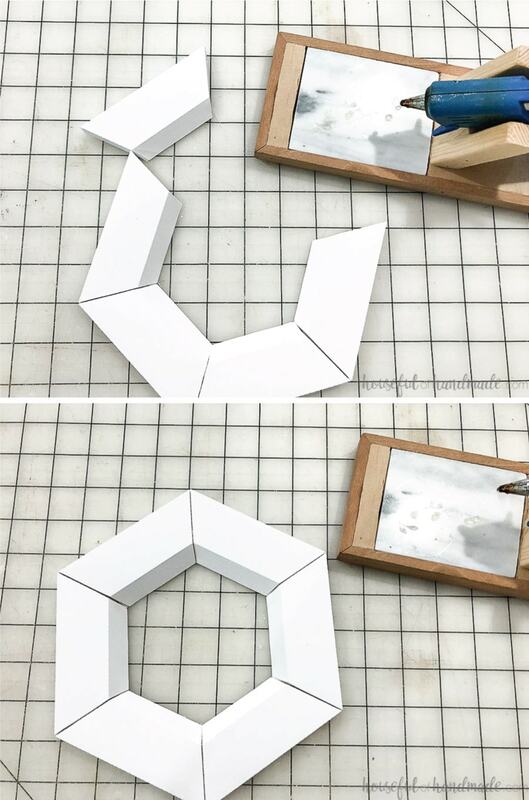 This amazing geometric mirror frame is made completely out of paper and no one can even tell! Love all the Joanna Gaines inspired metal signs, but don't have a laser metal cutter? You don't need one to make this faux metal sign. 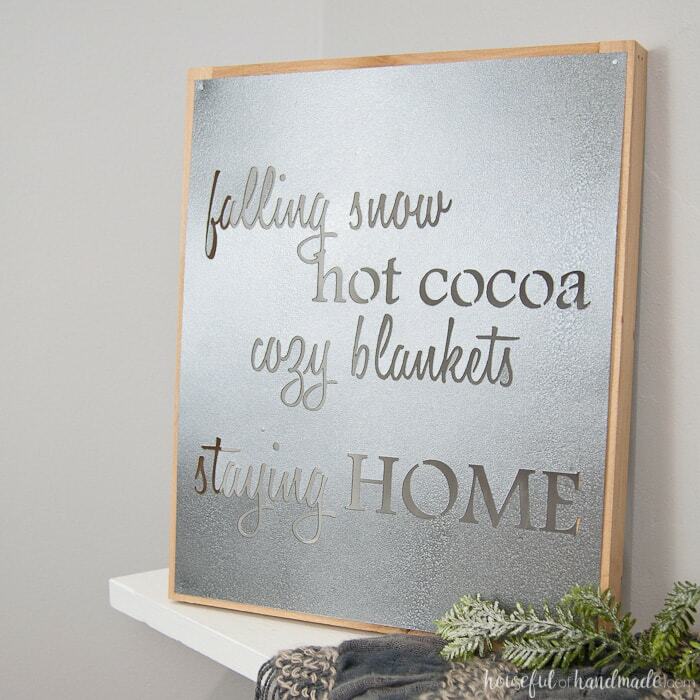 Perfect for decorating your house in the winter, or use this tutorial to create your own sign for any season! 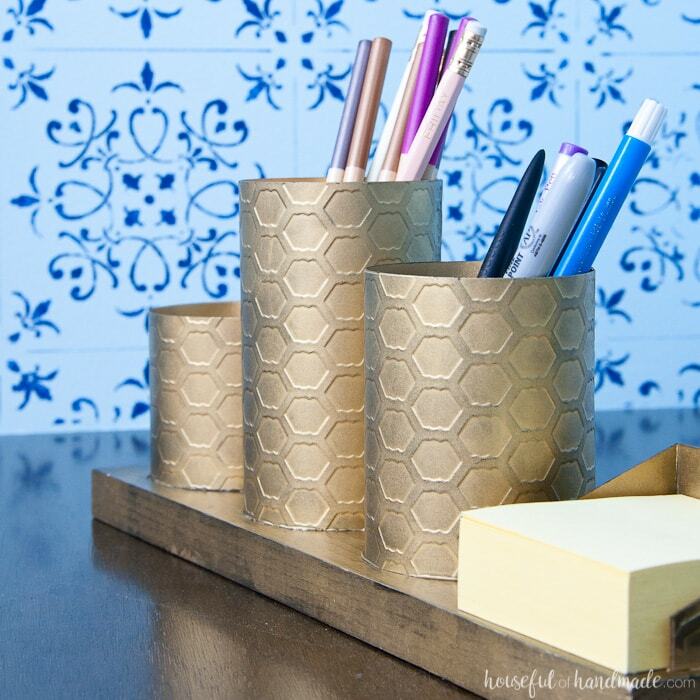 Embossed paper gives this simple desk organizer a chic look. And the easy brass painting technique makes it look like a fancy metal desk organizer instead of an inexpensive paper one.